Designed to alleviate Aches, Swelling & Discomfort associated with: Arms, Elbows, Fingers, Legs, Knees and Toes. Transdermal Innovations Inc. is a biotechnical research, development and production company that specializes in all-natural herbal remedies designed to better the lives of people - everyday, everywhere - across the globe. 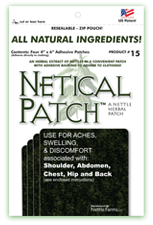 Today, we are home to a wonderful and innovative new product called the Netical Patch™ - a 100% All-Natural Herbal Product Designed to Alleviate Your Aches, Swelling, & Discomforts! 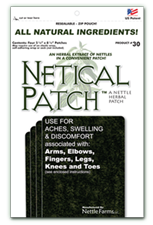 Our Netical Patch™ is a fully developed product using patented knowledge culminated from years of botanical research and thousands of applications. Historically, the daily use of nettles have been important to cultures around the globe, both topically and internally back to the earliest writings of mankind. The ancient American Indians, Egyptians, English, French, Germans, Greek and Roman armies used nettles extensively; not only as a food source, but also for many of their medicinal needs. Today, the use of the common nettle plant (Urtica dioica) continues as an efficient painkiller and a diuretic to treat swelling, aches and discomforts.